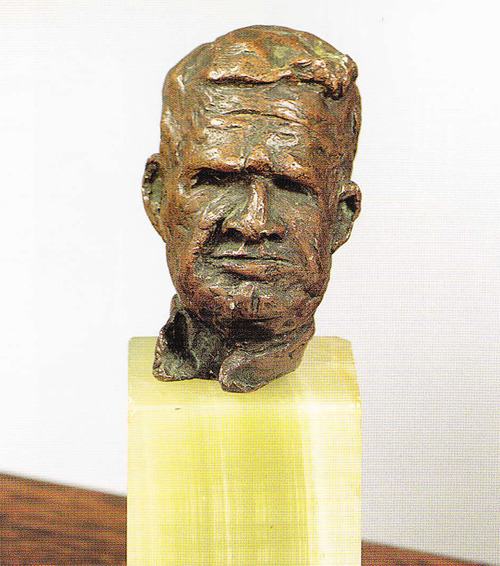 Andrew Bunney, jewellery designer, on a picture from a Sotheby’s auction catalogue – of a sculpture of Spencer Tracy made by Katharine Hepburn. AB I found it quite difficult to choose because I was looking for something simple or innocent enough to convey my ideal of beauty. I’m always looking through auction catalogues. I’ve always read a lot of autobiographies and I suppose this is an extension of that. GB So is the fact that this was made by Katharine Hepburn part of its appeal to you? AB It is relevant that it’s her, but not so much because of her personality – more to her environment and means. There have been these characters in certain times with such wealth that they could try things out that normal people couldn’t. When you see the estate of an interesting tycoon or celebrity, you know they’d have had access to objects and money to use in a very different way to most people. I do think it’s interesting that she made this during a covert relationship with Spencer Tracy – and the idea that she made this and took it everywhere with her on her travels is very sweet. GB So for you an element of its beauty is romantic? AB Yes, it’s incredibly romantic. And I like the fact that she was very creative and sculpted this herself. GB So you think it has merit as a sculpture? AB Well it did for her and that’s enough. To stand alone, probably not, but for me that’s not the point. I love that as an amateur she could be so open as to make something and be so happy with it that she had it cast in bronze. I think that’s very unusual. GB Do you see it as a work of art? AB I think it’s artistic. I see it as a private memento. It can be seen in the film, ‘Guess Who’s Coming to Dinner’ and it appears on a desk in the film. I like that too. I don’t know much about Spencer Tracy, only that it’s a sad tale and that Katharine Hepburn didn’t even attend his funeral out of respect for his wife and family. GB Would you like to own it? AB Yes and no. It’s a nice thing but having a picture is enough for me. I’m happy to own the catalogue. In a way, it’s too personal for me to have. I’d like to have the equivalent of this in my own life. GB It’s interesting that a lot of people have chosen objects of beauty that have a sentimental meaning for them. You’ve chosen one that had a sentimental meaning for someone else. AB I suppose so but I do think it’s beautiful. It must have been quite an indulgence to carry this thing around. I like the idea of that gesture, that sentimentality. GB Beauty must come up in your work a lot. AB I make unisex jewellery, which is slightly unusual. Men’s jewellery is often limited to cuff links and tie bars. Personally, I’m not interested in an object that dictates someone’s look. I’m interested in how they use an accessory and incorporate that into their own personal style. Clothing is less interesting to me in this regard because it serves its purpose for a much shorter time. Even vintage clothes like old denim can only be 50 or 60 years old to be wearable. Jewellery has this sentimental aspect, which is why it is important for me to work in precious metals rather than base metals because it can last through many lifetimes and mean something for a longer period. The history of how people wear jewellery is fascinating. Even the way that the Queen wears a brooch is very unusual. Firstly because not many people wear brooches today and secondly because she wears it high up and close to her shoulder. Things that light up the face in that way really do work. AB I think that for me it needs to have a purpose. That can take many forms of course – but it should have a reason to exist. GB Do your own pieces have a purpose? AB I hope so. Giving and receiving is an important purpose to me. When you see an auction catalogue and there’s a gift from the Duke of Windsor that’s been hand engraved that’s very meaningful. The object takes on a new meaning through this and there are few things today that can allow that. I know you can get your iPhone engraved at the Apple store but that’s not the same thing. It’s a sad fact that the physical form of the phone will outlive its purpose. We have all these products made in the digital age and they’re as perfect as can be but they’ve also stepped over a line and lost something somehow. Watch companies tell the story of how their craftsmen have taken decades to create the most accurate analogue watches but Casio can produce a digital one for $10 that performs better. So that watch is a better product but at the same time it has lost something. It’s more than craftsmanship. It’s at such a level that it’s hard to describe – but it’s a spirit or an energy that one watch has, and in the other, it simply doesn’t exist.